(2012.201.B0132.0213, Oklahoma Publishing Company Photography Collection, OHS). CHERRY, CAROLINE JANICE (1942– ). 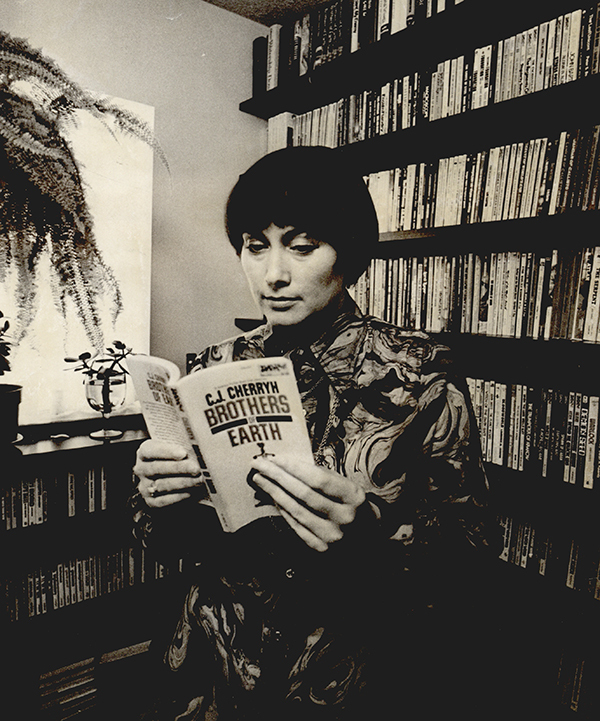 Born September 1, 1942, in St. Louis, Missouri, novelist and short-story writer Caroline Janice Cherry adopted the pen name C. J. Cherryh. She moved at age seven with her family to Lawton, Oklahoma, where she was raised. She began writing as a preteenager and continued in college at the University of Oklahoma, in 1964 completing a bachelor's degree in Latin. In 1965 she earned a master's degree in classics at Johns Hopkins University in Baltimore. From 1965 to 1877 she taught Latin, Greek, and ancient history and has been a semiprofessional archaeological photographer. She served as an artist in residence at the University of Central Oklahoma in Edmond in the 1980–81 academic year. Cherry's store of knowledge, continuing investigations in classical history and archaeology, and extensive travel have enabled her to construct complex, detailed fictional worlds, often ruled by women, within her novels and novel series. She has also published short fiction and short stories. Her first science-fiction book Gate of Ivrel, published in 1976 by DAW Books, received the John W. Campbell Award for best new writer of the year from the World Science Fiction Association. Author of fifty novels, she won a 1979 Hugo Award for her short Story "Cassandra" and another for her novel Kesrith, which also won a 1979 Nebula Award. She received Hugo Awards again in 1982 (for Downbelow Station) and 1989 (for The Betrayal). She was honored in the Oklahoma Professional Writers Hall of Fame in 1991. After returning to Oklahoma in the 1990s, she moved to Spokane, Washington, and continued to be a full-time writer. "C. J. Cherryh," Contemporary Authors (Farmington Hills, Mich.: Gale Group, 2001). C. J. Cherryh," Vertical File, Research Division, Oklahoma Historical Society, Oklahoma City. Dianna Everett, "Cherry, Caroline Janice," The Encyclopedia of Oklahoma History and Culture, https://www.okhistory.org/publications/enc/entry.php?entry=CH026.